Red coconut chutney for idli dosa can be prepared in many ways. My mom makes red coconut chutney with big onion or garlic. She also grind this chutney just with coconut, red chilli, tamarind and then temper with onion. This Kerala style red coconut chutney is prepared with a combination of coconut, red chilli, ginger and small onion. I followed Mia’s kitchen recipe and tried this for my breakfast as a side dish for dosa. Its very easy to make. I loved it a lot. Flavor of ginger and small onion is the highlight of this red chutney. I made it semi thick in consistency as per my liking. You can adjust its consistency and spice level based on your taste buds by altering the quantity of red chillies. 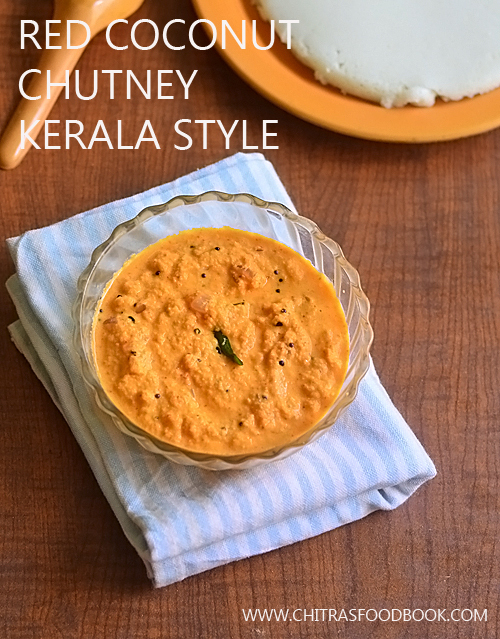 Friends, If you have not tried your hands on Kerala style red coconut chutney, you must try it. I am sure you will love it like me. Ok, lets see how to make red coconut chutney for idli and dosa in Kerala style with step by step pictures. Check out my 50+ chutney varieties too. Kerala style red coconut chutney for idli , dosa. Red chilli - 4 to 5 nos. Small onion - 3 nos. In a mixie jar, grind grated coconut, red chilli, small onion, ginger, tamarind, salt adding water. Temper mustard seeds, urad dal, curry leaves, red chilli and onion. Add to the chutney. Mix well. 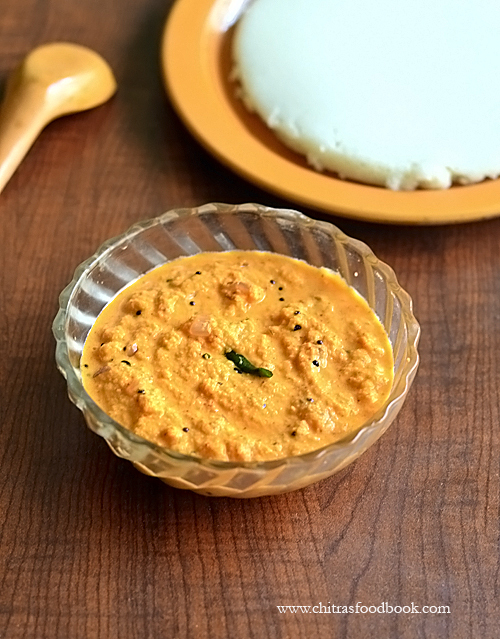 Serve this red coconut chutney with idli, dosa. In a mixie jar, take the grated coconut, red chilli, small onion, ginger, tamarind, salt to a coarse paste without adding water. Then add required water and grind to a smooth paste. Transfer the chutney to a bowl. Heat coconut oil in a kadai. Temper mustard seeds, urad dal, red chilli, curry leaves and small onion. Saute the onion till transparent. Add to the chutney bowl. Mix well and serve with hot idli, dosa. Drizzle with gingely oil if you like. Enjoy ! Adjust the quantity of red chillies as per your taste. Do not skip the onion. If you don’t have small onion, use half of the big onion. Do not add more ginger. It will dominate the flavor. Tempering in coconut oil gives nice flavor. 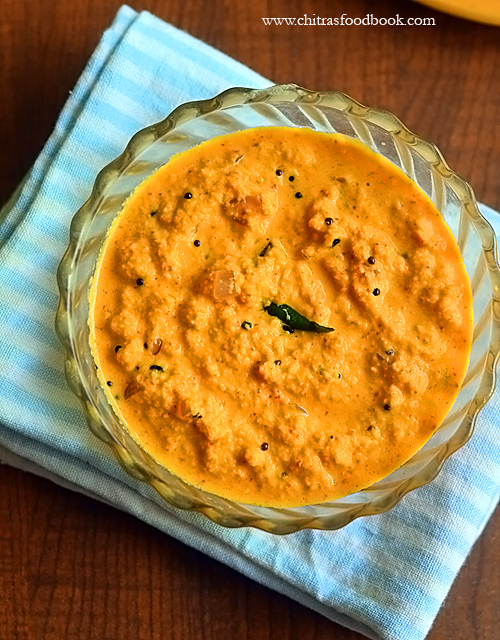 Enjoy this yummy, Kerala style red coconut chutney with idli, dosa !